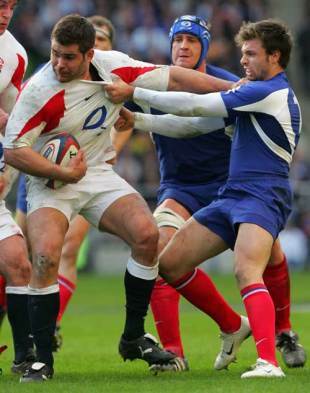 England and France will clash for the 92nd time when they go head-to-head in the 2009 Six Nations at Twickenham this weekend. For France it will be their their third Sunday appearance at Twickenham against England in the Six Nations - they won 18-17 in 2005 and lost 26-18 there two years ago. England lead the all-time series, that began in 1906, by 49 wins to 35 and the last of the seven draws was in 1985. The highest score in the matches is England's 48-19 win at Twickenham in 2001, though their best winning margin was 37-0 (also at Twickenham) in 1911. There have been 41 Tests between the sides at Twickenham since 1911. England lead by 25 wins to 11 and there were draws in 1922, 1959, 1961, 1971 and 1985. France's first win on English soil was in 1951 and further successes followed in 1955, 1967, 1975, 1977, 1981, 1983, 1987, 1997, 2005 and the 2007 Rugby World Cup warm-up match.